Fears of civil war over the separatist peninsula are growing. Yanukovych is defiant. SEVASTOPOL, Ukraine — Ukraine appealed to Western powers and the United Nations to help resolve the spiraling crisis in Crimea after unidentified armed men seized two airports and Russian troops were spotted making ominous movements around the peninsula. Even as Ukraine's ousted, pro-Russian president called for investigations of his ouster in a press conference from a southern Russian city, Ukraine's parliament asked the United Nations Security Council to hold a special session on the situation in Crimea and appealed to the U.S., Britain, and Russia to uphold a 1994 agreement to guarantee the country's territorial integrity. Russia has said that it wants to maintain Ukraine's territorial integrity, but spent several months flagrantly violating another point of the agreement, which agrees to refrain from pressuring Ukraine economically by threatening to cut aid if the country drifted out of the Kremlin's embrace. Acting President Olexander Turchynov, who is also the speaker of parliament, presided over an emergency Ukrainian security council meeting as reports trickled in of Russian troop movements. Russia, Turchnyov told reporters, had used a military drill as cover for an "Abkhazia scenario," referring to a breakaway territory of Georgia Russian troops occupied after a five-day war in 2008. "I am personally addressing President [Vladimir] Putin to stop the provocation and call back the military from the Autonomous Republic of Crimea, and work exclusively within the framework of the signed agreements," Turchynov said Friday evening. "The whole civilized world supports Ukraine. We demand to stop this provocation, we demand to normalize the situation." Acting Interior Minister Arsen Avakov wrote on Facebook that the groups of armed men who took control of Simferopol and Sevastopol airports Friday morning were Russian soldiers and accused the Kremlin of an "armed invasion and occupation." "This is a direct attempt to provoke armed bloodshed on the territory of a sovereign state," Avakov wrote. U.N. diplomat Robert Serry met with Turchynov on Friday and told him the organization was "ready to offer all and any help possible to solve the difficult situation that has arisen in Crimea," Turchynov's Fatherland party said in a statement. The U.N Security Council was set to hold a closed-door meeting later Friday. President Obama called Russian actions in Ukraine "deeply destabilizing" on Friday and warned that incursions into the country by Russian forces would violate international law. "We are now deeply concerned by reports of military movements by the Russian Federation inside Ukraine," Obama said in a late afternoon statement from the White House. House Intelligence Committee Chairman Mike Rogers said it looked as though Russia had taken over the region. "It appears that the Russian military now controls the Crimean peninsula. This aggression is a threat not only to Ukraine, but to regional peace and stability," Rogers said. "Russia's latest action is yet another indicator that Vladimir Putin's hegemonic ambitions threaten U.S. interests and allies around the world." Secretary of State John Kerry told reporters that the U.S. would watch to see if Russia "might be crossing a line in any way," but said the White House would be "very careful" before making any judgements. Russia's foreign ministry confirmed in a statement that the armored personnel carriers spotted around Crimea were Russian, but said that they were only working to supply their naval base in Sevastopol, as permitted under a deal with Ukraine. The ministry added that Russia sees events in Crimea "as the consequence of recent internal political processes in Ukraine" and would not intervene. Twenty men BuzzFeed found guarding the road to Sevastopol airport Friday afternoon were wearing civilian clothes and black-and-orange bands symbolizing the Soviet victory in World War II, which saw heavy fighting in Crimea. A dozen well-armed soldiers stood watch over them, but it was not clear which country they represented. Andrei Sitnikov, a local villager guarding the post, said he called out to the armed men, but they wouldn't speak to him. "I'm out to defend my family. I'm not scared of them," he said, as a truck towing an armored personnel carrier with no license plates drove past. 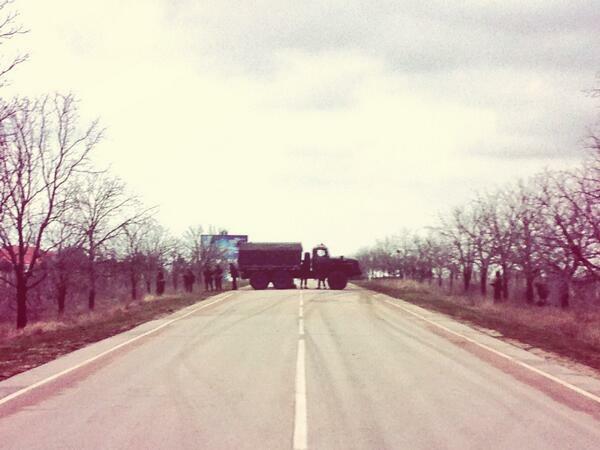 Trucks BuzzFeed saw on the road from Simferopol, the provincial capital, had black Russian military plates. Russia has backed separatists in Georgia and other nations on its perimeter, and Ukrainian leaders fear that Moscow will use the tactic to weaken the power of the central government and give it an even stronger foothold in the divided country. Russia's parliament is to debate bills that would make it easy for Crimea to join Russia and for Ukrainians to obtain Russian citizenship, a tactic used in the breakaway Georgian territories of Abkhazia and South Ossetia. They have also taken in Viktor Yanukovych, who claims he is still Ukraine's legitimate president, despite fleeing Kiev in the early hours of Feb. 22. "Nobody overthrew me in Ukraine. I was forced to flee under threat" from Nazis "representing the absolute minority in Ukraine," Yanukovych said. "I intend to fight for the future of Ukraine against those who are trying to saddle it with fear and terror." He also appeared to blame the U.S. and Europe for his ouster: "The shocks and victims are the result of the irresponsible policies of the West, which supported the Maidan," he said, referring to the central Kiev square that has been the heart of protests. How much Russian support Yanukovych actually enjoys is another question. During his press conference, Yanukovych said he and Putin would meet when the latter "had time" and implored him to break his weeks-long silence on the Ukrainian crisis. In conversation with British Prime Minister David Cameron, however, Putin said early elections scheduled for May 25 were "the best way to secure a positive future for Ukraine in which all Ukrainian people are represented." That essentially means the Kremlin has dropped Yanukovych, who says the elections are illegal and is refusing to participate in them. The Kremlin said Putin told Cameron, German Chancellor Angela Merkel, and European Council chairman Herman van Rompuy that any further violence was unacceptable. Ukraine's general prosecutor's office asked Russia to extradite Yanukovych on charges of mass murder for violent clashes last week in which dozens died, though the Kremlin's apparent sheltering of the ousted leader and continued recognition of him as Ukraine's president makes the prospect of that seem unlikely. Ukraine's security forces have been divided on how to deal with Crimea, which is home to many members of the Berkut riot police unit widely reviled in Kiev for their attempts to suppress the months-long encampment on the Maidan. Turchnyov fired army chief of staff Yuri Ilin Friday without specifying reasons. Ilin became chief of staff last week when Yanukovych fired his predecessor for not using the army against protesters in Kiev. Ukrainian outlet Levy Bereg reported that Ilin was hospitalized in Sevastopol Thursday after suffering a heart attack. Turchnyov also replaced the head of Ukraine's interior ministry conscript troops later Friday. Gennady Moskal, a former Crimean police captain now in parliament, has claimed that many of the armed men seizing government buildings in the peninsula were Berkut members revolting against the new government. Avakov said earlier this week that Ukraine would dissolve Berkut and only allow former members who met strict requirements to join its replacement. Then on Friday, Russia's interior ministry said it would hire the former Berkut troops once they received expedited Russian citizenship. Russia later announced its consulate in Simferopol would give the division Russian passports. A Russian foreign ministry spokesperson told BuzzFeed the entire 4,000-strong division would be eligible for a passport, but declined to say why Russia was offering them. A sign outside the consulate said it was closed until Monday, after which it will only accept appointments made in advance by phone. Rustam Temirgaliyev, first deputy prime minister in the new Crimean government, said on his Facebook page that late Thursday night he had met Berkut fighters. They agreed to form a new Crimean special forces unit, also called Berkut, that would answer only to the Crimean government. Legislators in the Crimean parliament supported the decision today, according to Temirgaliyev. It was not immediately clear who the men occupying the airports, dressed similarly to men who occupied Crimea's parliament Thursday, were. Russian state media claimed the men were members of Crimean "self-defense" units formed in the autonomous province in response to the violent overthrowal of Yanukovych last week. A spokesperson for Russia's Black Sea fleet, which stations about 15,000 troops in a naval base in the Crimean port of Sevastopol, denied that it had blocked the airport there, but did not comment on the airport in Simferopol, the provincial capital. Reports trickled in of Russian troop carriers driving around near Sevastopol, where Ukraine's border service said Russia's military had blocked the sea border at Balaklava. Russian media reported by nightfall that the Ukrainian government had closed all airspace over Crimea, though both airports were still open. Ukraine's telephone monopoly lost all contact with Crimea and phone service within Crimea after men seized its nodes. The United States has warned Russia not to interfere militarily in Ukraine, which White House national security advisor Susan Rice said earlier this week would be a "grave mistake." Russia has claimed throughout the Ukrainian political crisis that it would not interfere in Ukraine's internal affairs, but has rattled sabers considerably since Yanukovych fled Kiev. President Vladimir Putin mobilized thousands of troops to the Ukrainian border for military exercises to last until March 3 earlier this week, which the U.S. was warned about in advance. Putin has yet to comment on the Crimean situation. Several members of parliament from Putin's United Russia Party arrived in Crimea Thursday to support its Russian aspirations. The Night Wolves, a biker group that has appeared at rallies with Putin, are rallying around Crimea and southern Ukraine against the new government. Lawmakers from a nominally oppositionist but Kremlin-controlled party introduced bills Friday that would facilitate Crimea becoming part of Russia and offer Russian passports to Ukrainians. The Kremlin has handed out citizenship en masse in other post-Soviet separatist regions, including the Georgian breakaway territories of Abkhazia and South Ossetia, which it has occupied since a four-day war in 2008. Crimea only became part of Ukraine in 1954 and retains autonomous status within Ukraine. Most of the population is ethnic Russian and supports closer ties with Russia, though it has active Ukrainian and Tatar minorities. Local lawmakers fired the provincial government under the watch of yet more armed men this week and announced their intent to hold a referendum on effective secession on May 25, the same day Ukraine plans for presidential elections. Vitaly Klitschko, a former boxing champion and the leader of the opposition UDAR party, announced Friday that he would run in the election. Klitschko said former prime minister Yulia Tymoshenko, released Feb. 22 after being jailed for two years by Yanukovych, had told him she would also run. Yanukovych said that both parliament and the presidential election were "illegitimate" and that he would not run. Switzerland seized the assets of 20 Ukrainians Friday, including those of Yanukovych and his son Alexander, whose meteoric rise to spectacular wealth on the back of lucrative state contracts provoked much of the anger at corruption fueling the protest movement in Kiev. Austria and Liechtenstein also announced it had frozen the assets of 18 Ukrainians linked to the violence Friday. Arseny Yatsenyuk, who became acting prime minister Thursday, announced that $37 billion in loans went missing during the three and a half years of Yanukovych's rule. Yanukovych denied having any foreign assets. Senator Chris Murphy issued a statement Friday saying that the committee was working on legislation to authorize "financial and technical assistance" to Ukraine and it would be part of a "coordinated program with the European Union, IMF and other international partners." Ukraine has said it needs $35 billion over the next two years in order to avoid default. Lucian Kim reported from Sevastopol. Max Seddon reported from Kiev. Contact Lucian Kim at luzikim@gmail.com.